The Gulabi gang (from Hindi gulabi, "pink", transln. 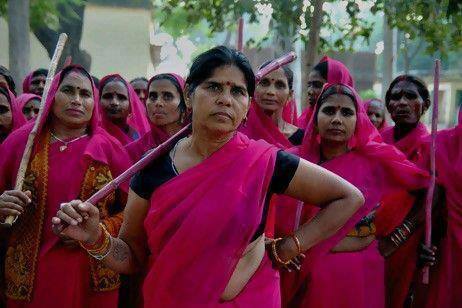 "pink gang") is a group of women vigilantes and activists originally from Banda in Bundelkhand district, Uttar Pradesh, India.The gang was founded in 2006 by Sampat Pal Devi, a mother of five and former government health worker (and a former child bride), as a response to widespread domestic abuse and other violence against women.They have also stopped child marriages and protested dowry and female illiteracy. Serious badasses.